Despite being hailed as Britain’s greatest living film director by the London Evening Standard, Liverpool’s Terence Davies is not widely known. Over a 37-year career, he has only made six feature films, most of which are deeply personal stories about outsiders. This is certainly true of The Long Day Closes (1992), an autobiographical coming-of-age tale set in 1950s Liverpool. It depicts Davies’ happiest years – after his abusive father died and before puberty set in. Bud (McCormack) is a young boy who is devoted to his kind mother (Yates) and escapes the humdrum of every day life by going to the cinema. 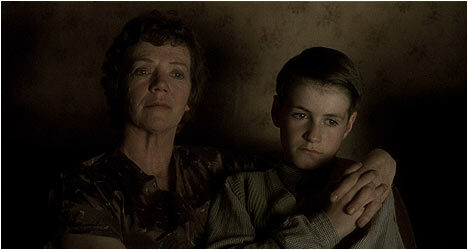 Davies shows us the close bond between Bud and his mother, who comforts the boy when he awakes from a nightmare. Davies eschews a typical coming-of-age tale by going back and forth in time in Impressionistic fashion as he looks back at his childhood with fondness. He also avoids the gritty kitchen sink realism approach and instead segues into dreams and fantasies that encompass his fears and desires at the time. The Long Day Closes is beautifully shot, especially in the way it plays with light, like how it shows the passage of time via a shot of a rug that goes from the darkness of night to the light of day. This is also evident in the depiction of Bud’s flights of fancy with his family enjoying Christmas dinner with a street lamp nearby and snow falling that is a truly magical moment as classical music swells with emotion. The Long Day Closes is an unabashed romantic look at a particular period of Davies’ life; done in a way that feels heartfelt and not full of sappy sentimentality. He finds warmth and solace in family gatherings and holidays where neighbors are friendly to each other. There is a real sense of community. He also shows the importance of school and the church in Bud’s life and how, along with family, was his whole world. The cast of unknowns are uniformly excellent, especially Leigh McCormack who delivers a thoughtful and sensitive performance. The Long Day Closes is a vividly rendered look at a bygone era that immerses us in its sight and sounds. So many coming-of-age films take a simplistic approach, which Davies refuses to do. Instead, he offers fragmented reminisces and snapshots out of time that attempt to replicate the selective nature of memory. He has created a deeply personal film rich in detail and full of humanity. This evocative film looks great on this new Blu-Ray transfer. The colors are sharper with considerable detail to the image. Excellent stuff! There is an audio commentary by director Terence Davies and cinematographer Michael Coulter, who points out that the screenplay had meticulous camera directions and he jokingly told Davies why did he need a cameraman? Davies mentions that the various voiceovers are excerpts from some of his favorite films. The director speaks of casting Leigh McCormack as his cinematic alter ego and how little the boy was interested in acting. There is an excellent 1992 episode of The South Bank Show featuring Davies talking about growing up in Liverpool, his career up to that point, and, of course, The Long Day Closes. This is a fantastic primer on his work and this film in particular. Also included is an interview with film critic and professor Colin McCabe, who is also executive producer of the film. He talks about the challenges of getting financing for such an unconventional project. There is an interview with production designer Christopher Hobbs who talks about his work on the film, which included realizing Davies’ vision, recreating his childhood on film. He talked at length with the director about his childhood in order to get the details that would help him recreate it.